I immediately ran over and said "Stop! Don't do it!" "Why shouldn't I?" he said. are you religious or atheist?" "Religious." "Me too! Are you Christian or Jewish?" "Christian." "Me too! Are you Catholic or Protestant?" "Protestant." "Me too! 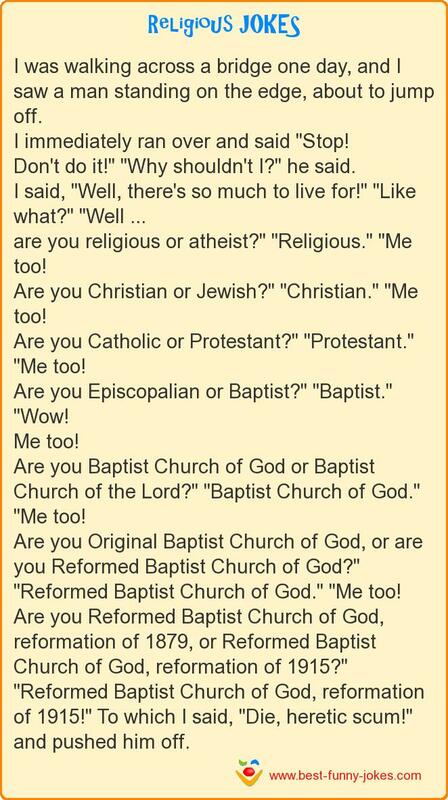 Are you Episcopalian or Baptist?" "Baptist." "Wow! Are you Baptist Church of God or Baptist Church of the Lord?" "Baptist Church of God." "Me too! Are you Original Baptist Church of God, or are you Reformed Baptist Church of God?" "Reformed Baptist Church of God." "Me too! Are you Reformed Baptist Church of God, reformation of 1879, or Reformed Baptist Church of God, reformation of 1915?" "Reformed Baptist Church of God, reformation of 1915!" To which I said, "Die, heretic scum!" and pushed him off.